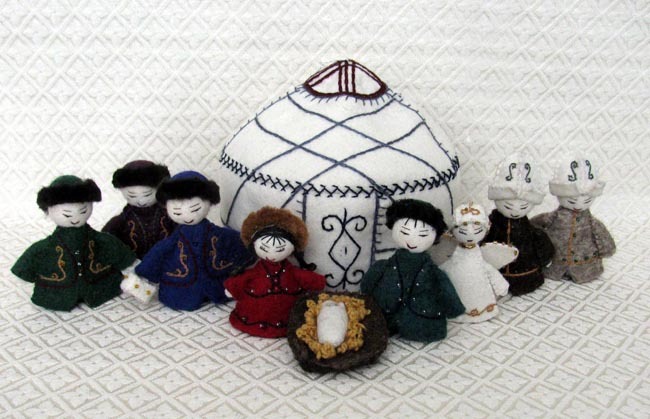 This Nativity is handcrafted from wool felt by Asel in the remote town of Naryn, Kyrgyzstan. The Holy Family is joined by an angel, two shepherds, and three wise men. The set now includes all of the pictured figures plus the embroidered yurt. The figures measure 3.5 inches tall. Asel’s husband injured his neck as a young man. He is willing and eager to work, yet he has difficulty doing most types of labor because he experiences pain and blackouts. Their family, made up of Asel, her husband, and two daughters, relies heavily on the profits from the sale of Asel’s handicrafts. $85. Please click here for purchasing instructions. Special order.